Value Ideas Blog» Blog Archive » QuickCheck SMT Scharf AG – Service Business selling for 10x EBIT? Home » General » QuickCheck SMT Scharf AG – Service Business selling for 10x EBIT? You can find an older presentation for the EK-Forum here. A nice video about the product can be found here. Despite the fact that SMT Scharf is based and listed in Germany, due to the fact that over 91% of its revenue come from abroad, it is more or less an emerging markets play. The key countries are China, which stands for 29% of revenues, followed by Russia and other states of the GUS (21%), Poland (18%) and South Africa (15%). A further interesting fact is that SMT Scharf is the German company which makes the highest proportion of its revenue in Russia. 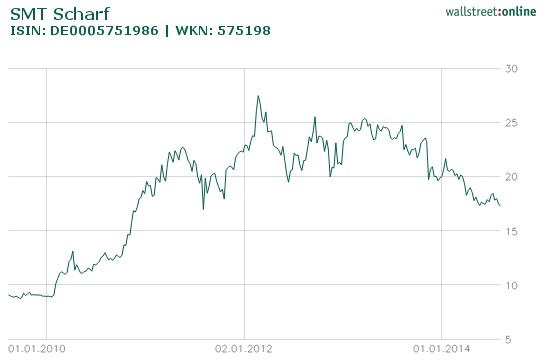 Due to the rising demand in commodities the last years were really good for SMT Scharf. In the following chart you can observe the change in EBIT-Margins and the strong development in equity. Already in 2012 the guys from Shareholder Value where really excited about the high level of stable recurrent earning of the company which come from the high maintenance and service spending’s on already installed rails. When I remember correctly, one perosn told me that over a 5 year cycle a costumer has to spend 2/3 of expenditures into maintenance and services and 1/3 are the initial installation costs. At the moment service stands for 49% of the overall revenues of SMT Scharf. Due to the lock-in effect the sustainable EBIT margin on the service segment shut be around 20%. What is really interesting, is that the normally so stable service segment has taken a strong hit as well, the revenue in this segment is down to 30,8 Million Euro from 44,3 million in the year of 2012. In my opinion, the only reasonable explanation for this contraction is that the service is linked to hours of usage, (in the heavy machinery business you also write down your tools in accordance of usage hours). I think that you will see a further decline in earnings in the new half-year report which will be published at the 14.08.2014. 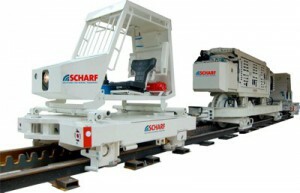 Now we come to the interesting fact, due to the relatively low share price and net cash on balance sheet SMT Scharf is valued with an Enterprise Value of a little bit less than 70 Million Euro at the moment. As a long term investor I’m normally willing to pay a 10x EBIT multiple for recurrent earnings. When SMT earns its 20% EBIT Margin on its service business they will earn an EBIT of 6,16 Million Euro on the depressed level of 30,8 Million in service revenue. To put it in a nutshell, at the moment you can buy this business for 10x EBIT on its depressed service earnings and get the rest of the business nearly for free. When they come back to a normal level in maintenance revenues it would be a buy for an EV/EBIT of around 8 + the rest of the business for free. The potential bribery problematic in China, Russia and the inherent potential tail risk. Until not long ago you had a mediocre management and board, this was changed on the last general meeting by Shareholder Value Management AG. Related to 1., they have a subsidy in Donetsk Ukraine and an overall high level of sales in Russia which can lead to a further drop in profits and revenues. I have not invested in the company in 2012 and will not do it in the future due to the fact that we follow a sustainable approach. Furthermore SMT Scharf is mainly active in China and Russia where it is kind of normal to bribe people to do business. Therefore there is a potential tail risk due to the fact that china has increased its anti-bribery efforts. I’m not stating that SMT Scharf is really involved in bribery but I cannot exclude this risk for myself. * Coal – also for Germany specifically. I read in 2009 that subsidies on German coal were to be abolished in 2018. Still the case? This would especially be very detrimental to the ‘stable’ servicing revenue – not just after 2018, but also before in anticipation. Maybe a reason for the decline in this revenue segment last year? 1. 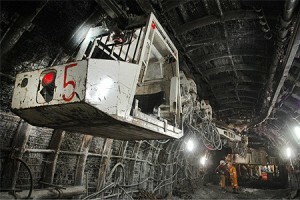 Coal stands for 83% of revenues of SMT Scharf, followed by 15% Gold and Platinum mines and 2% other mines. 2. You are absolutely right, but germany stands only for 8% of overall revenue, and this is only service revenue. I think the decline in service revenues is more or less related to lower maintenance efforts which are by them self related to the hours of usage. When the coal consumption is lower, the mines normally reduce their output and after a while some mines get closed, which can be a future problem of SMT Scharf.